When you have been in this industry as long as some of us have, the emergence of certain "trends" are often the source of much amusement. You might be thinking of the endless tussle for dominance between the likes of Intel and AMD, or ATI and NVIDIA, but zoom out a little further. Back in the 1990's, processors and graphics cards ran cool enough to be cooled with simple aluminium heatsinks with no fans. Come the turn of the 21st century, the progress in providing us greater processing power outstripped our abilities to cool those hundreds of millions of transistors. "Who cares?" we said, "look what we can do now!" Enthusiasts simply installed fan after fan and we reached a point where one's CFM (cubic feet / minute) throughput became almost as braggable as one's gigabytes and gigahertz. It was speed at all costs and if the noise bothered you, just wear headphones. Fast forward to today and things have swung back the other way. High-end gaming performance is still important but for the other 95% of the day when you're not gaming, people want a system that is merely "fast enough" for Windows work and is otherwise as quiet as possible. 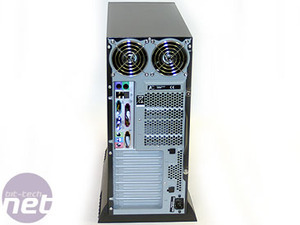 Watercooling aside, this usually involves large, slow-moving fans and big heatsinks. In fact, you could do worse than posting a blank cheque to QuietPC. Normally, the products on such a shopping list would come with Zalman on the box but in this case, we turn not to Korea but to Switzerland and low-noise experts, Arctic Cooling. 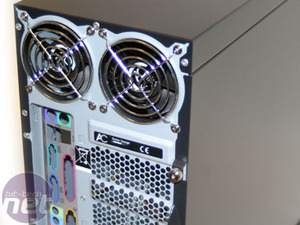 Having made their name with low-noise GPU coolers (as used by HIS on various retail ATI X800-series cards) Arctic Cooling have applied their expertise to designing a low-noise case. 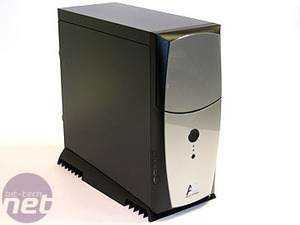 We give you the Arctic Cooling Silentium T1. At first glance, the case doesn't appear to be anything out of the ordinary; certainly not ugly but otherwise largely unremarkable. At nearly 12KG (26 pounds) the steel chassis is pretty heavy, especially if you are used to lightweight all-aluminium cases. 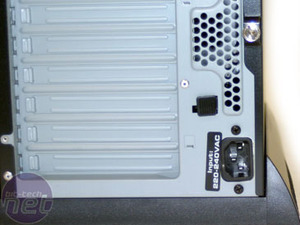 The front bezel is silver plastic under a layer of clear perspex; the drive bays are hidden by a door and the front is dominated by a power button that is a full 30mm in diameter. Behind the door we find two DVD bays and two floppy drive bays - hardly generous but more than adequate for most users. 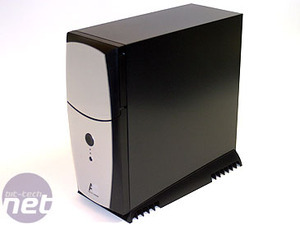 Given the compact dimensions of this mini tower case, it's about par for the course. Moving around to the back of the case raises several eyebrows. 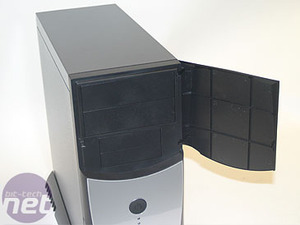 As you can see, rather than the single 120mm fan favoured by most low-noise cases (such as the Antec P180) the Silentium T1 has two 80mm exhaust fans at the top. Also of intrigue is the placement of the kettle-lead power socket at the very bottom. There is something very different about this case... time to look under the hood. It's been six years since we've had to suffer the high pitched whines from Gorbs and Blorbs, but now we have two huge new coolers from Thermaltake: the MaxOrb and V1 to make up for past illnesses.